Moody Blues - Alan Moody Fundraiser - The Car And The Star! Back in August last year Blues fans, spear-headed by the Shrimpers Trust, held a campaign in tribute to Alan Moody, our record appearances holder with 504 games in a Shrimpers shirt. An incredible £11,600 was raised (from collections, online donations, auctions and even a fans cricket match) to help fund a specially adapted car to meet the challenges Alan now faces. Alan was signed from Middlesbrough in 1972 and went on to play for us 504 times before leaving in 1984. During that time he featured in two promotion winning teams and took part in many games which are significant landmarks in our history including cup games against Liverpool and Derby. As a central defender Alan also had an excellent strike rate, netting 44 times, and to this day remains our most prolific ever penalty taker. After hanging up his boots Alan earned a living as a golf club secretary, a sport he loved. However, since a life-saving operation in 2015 which led to both of his legs having to be amputated, he has relied on his loving family, friends and a wheelchair to move around. He desperately though wanted to drive again and re-gain greater independence. Well, after a difficult year getting his licence renewed and the appropriate tests passed, we are thrilled to learn that Alan is now back behind the wheel and driving once more. 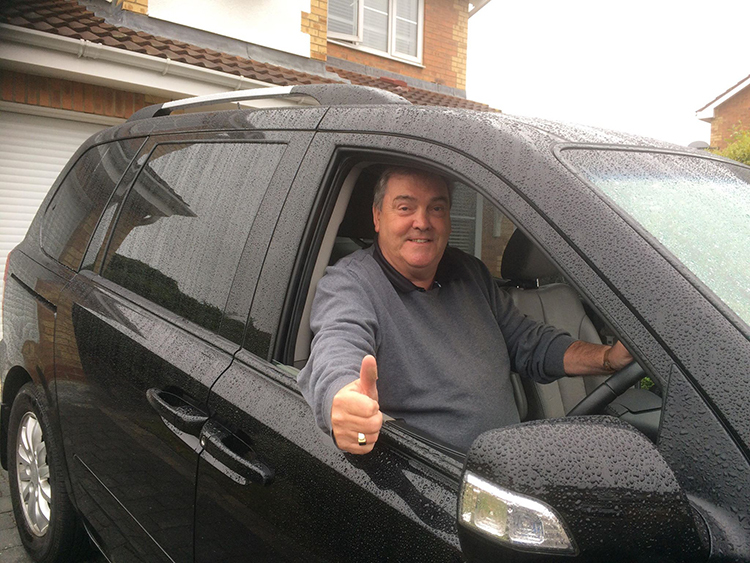 Alan's new car allows him to transfer from his wheelchair to the driving seat and he is delighted with this new-found freedom. "Getting back behind the wheel has not been easy but it is a wonderful feeling to be driving again. I'd like to once again to give my heart-felt thanks to the Southend supporters for all that they have done including the many messages of support I received. Returning to Roots Hall last season too was memorable and I hope maybe to do that again in the future." The "Moody Blues'' campaign last year also inspired the Shrimpers Trust to set up SUEPA - the Southend United Ex Players Association - which now has approaching 150 former player/ex-coaching staff members. We hope to provide news of some forthcoming SUEPA events in the coming months. Alan, we salute you, you are a true Southend United legend, an inspiration both on and off the pitch during your time with us and an inspiration today in over-coming adversity. We too hope to see you back at Roots Hall very soon.